Congratulations to Pam S. of Ellington, CT! 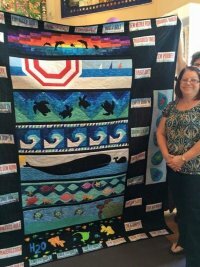 For more photos of winning quilts with our row in them, scroll to the bottom! 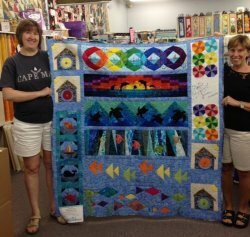 Row by Row™ Experience began in 2011 with 20 quilt shops across New York State. In 2012 the event grew to include 62 participating shops. Pennsylvania came on board in 2013 for a total of 138 shops throughout the two states. 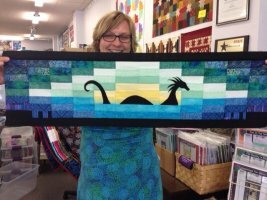 In 2014 over 1250 quilt shops participated in 34 states and Ontario. 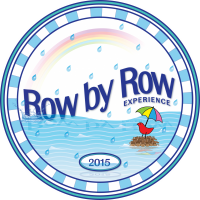 Plans are underway for the biggest and best Row by Row™ Experience ever in 2015! All 50 states and several more Canadian provinces are planning fun for travelers throughout the summer. 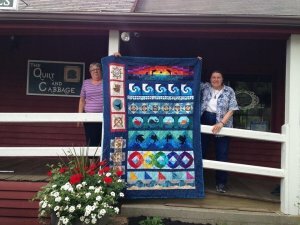 Although the quilt shops are organized by area, quilters have no borders. 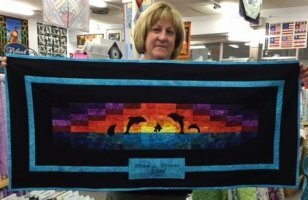 Travel, shop, collect patterns and add rows to your quilt from any anywhere! New!! How to keep track of your travels!!! The best way to keep track of the shops you visit is to keep a log. I've designed a log sheet and a cover page for your Journal. 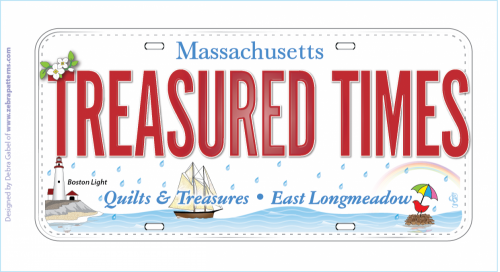 Here is what our Row and license plate look like! They will be available on June 21st! 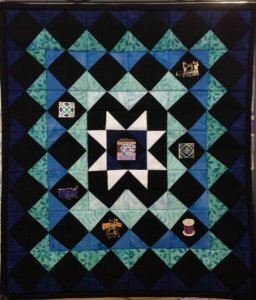 Plus I've ordered a Quilts & Treasures Logo Pin!! Here it is! Much prettier in person!!! 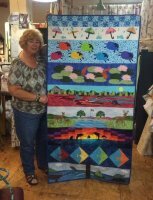 And to help you display your pins.....Valerie has designed a quilted pin holder! 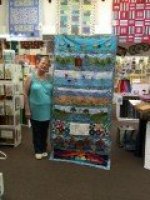 It can be a wall hanging or fit on a table top stand. It holds 37 pins! Kits and/or patterns are now available! 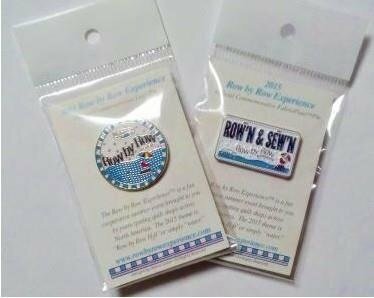 Kit does not include pins...but we do have those shown available for purchase. All pins are $5.75 each. 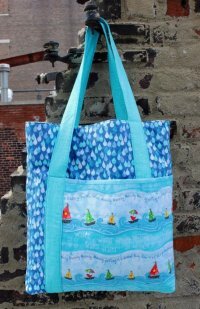 Timeless Treasures has designed a special Row By Row™ H2O bag! We have the directions for the bag! 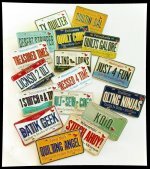 Also License Plate Pins! Ours is on sale now! Our Kick-Off Event will be on Sunday, June 21 from noon to three! No registration required. Stop by for some special sales and door prizes. There will be two short presentations of projects made from last year's rows and hints & tips to plan and organize your travels and rows. They will be at 12:15-12:45 and again from 1:15-1:45. Do you love to multi-task??? 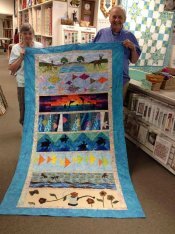 We found that The Quilt Shop Navigator is sponsoring The Ultimate Shop Hop going on from May 1-Dec 1 that you can do while you are collecting rows! Just purchase a copy of their directory (psst...you can get one from us) and the passport is inside it. For more information about their hop and prize information, visit their website. 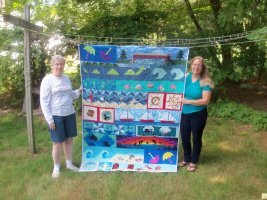 Winning quilts with our row! 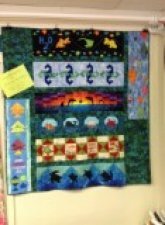 And here is what some of our customers have done with our row! !